The TimeCutter MX5025 zero turn lawn mower is powered by 23 hp Kawasaki® V-Twin 726cc engine. 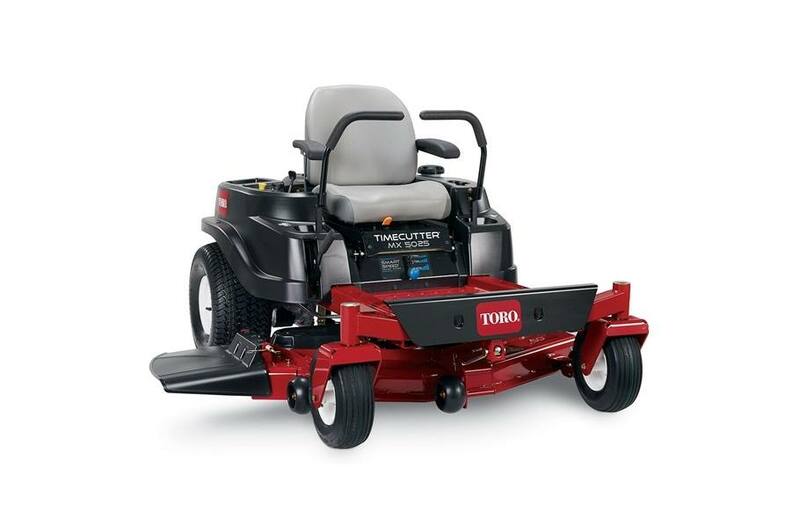 Featuring a 50" 10-gauge fabricated steel mowing system with convenient washout port. With great features like our exclusive Smart Speed® control system it allows you to choose from 3 speeds giving you greater control when trimming, towing attachments and mowing. 2015 Fabricated Deck: Welded together from plates of 10-gauge steel and a bull-nose bumper leading the way, this deck can handle tough conditions. The lower the guage the thicker the steel. Washout Ports: Deck washout ports create a pressure washer under your deck providing quick cleaning, maintaining optimum airflow for optimum cutting performance. Heavy-Duty 10-Gauge Frame: The heavy-duty 10-gauge frame provides increased strength, durability and reliable performance. The lower the gauge the thicker the steel. 2015 Smart Speed® Control - Trim, Tow, Mow: Toro's Smart Speed® control system lets you choose from three ground speed ranges for optimal performance. Use low TRIM range to trim closer for maximum time savings, choose medium TOW range for towing attachments, or select high MOW range to mow large open areas and finish quickly. 2015 18" Thickly Padded Premium Seat: Premium, thickly padded 18" extra-tall seat provides ample back support for a smooth, comfortable ride. *The gross horsepower of these engines was laboratory rated by the engine manufacturer in accordance with SAE J1940. As configured to meet safety, emission and operating requirements, the actual engine horsepower on these mowers will be significantly lower.